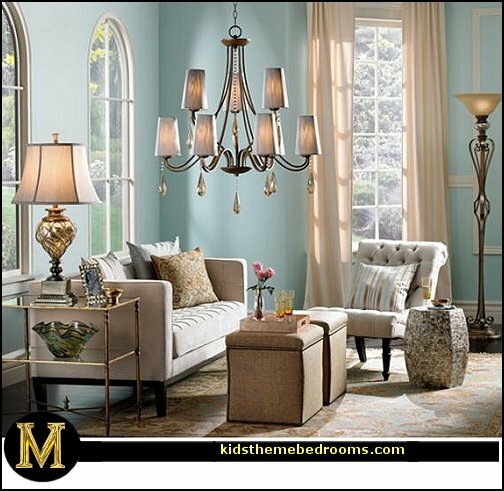 Do you love the Luxe Living look for its richness and sophistication. And the bling, of course! 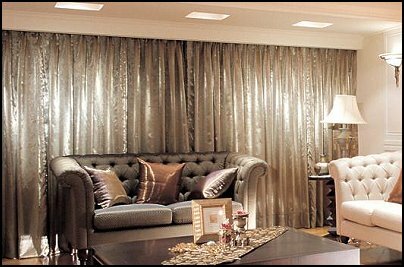 Bring the Hollywood feel into the living spaces of your home with lush fabrics and opulent finishes along with mirrored furniture ..... and glam up those bedrooms with crystal bling and mirrored accents. Black furniture becomes a backdrop for rich purple tones and chrome finishes in this elegant room setting. The design uses three colors - silver chrome, black, and purple - and achieves a dramatic impact. 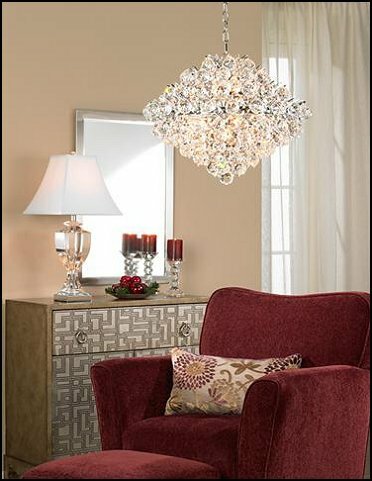 Uttermost Fascination 3-Light Chandelier - chandelier updates the classic appeal of crystal for today's sophisticated tastes. 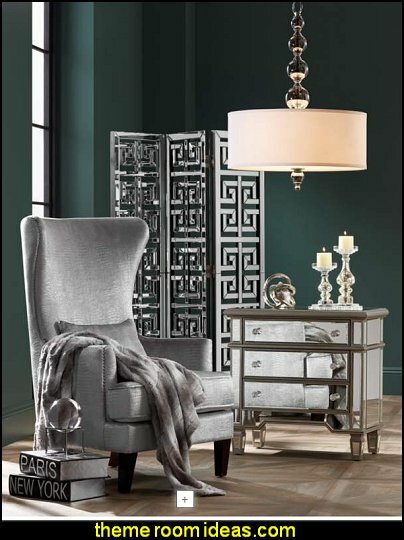 It features silver finish metalwork adorned by crystal accents and a silken drum shade. Director's Chrome and Espresso Tripod Floor Lamp - feel like a director with this industrial-contemporary tripod floor lamp. The design features an adjustable spotlight style head that can be positioned to direct light right where you need it. Zebra Rugs - rug features an exotic zebra pattern that will add an adventurous aura to your decor. Clear Crystal Taper Candle Holder - crystal candle holder provides stunning good looks. 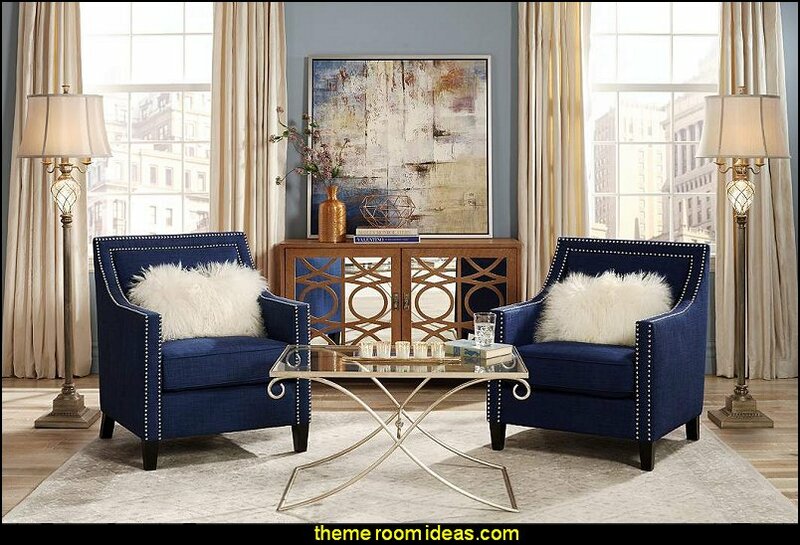 Great for formal decors, it's also a striking complement to a fun, eclectic look. Perfect for the coffee table, buffet, or as a dramatic centerpiece. 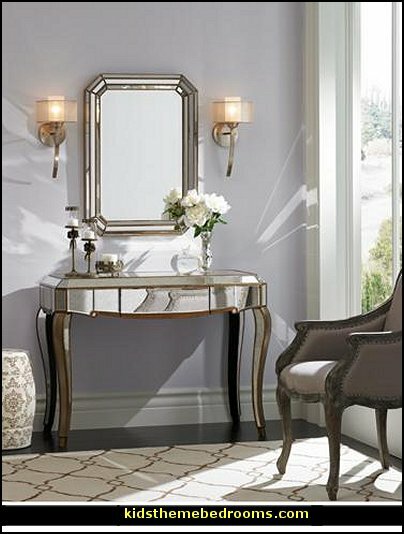 The Luxe look is about bright, lustrous accents and luxurious finishes. 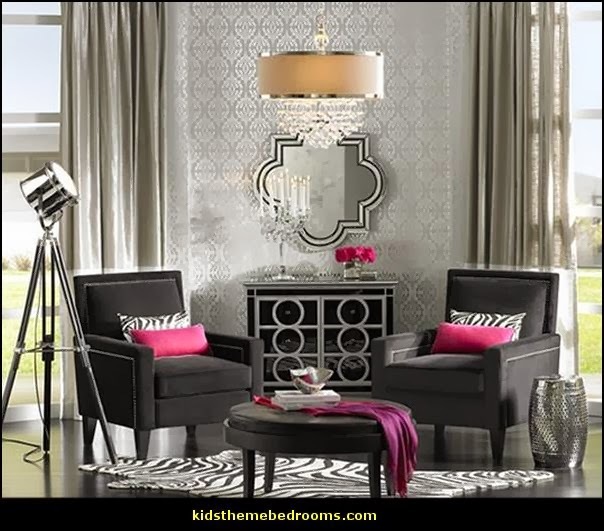 Nailhead trim chairs are a timeless addition to any interior, but the fun comes when you bring the bling: mirrored furniture, brilliant side tables and sunburst mirrors. 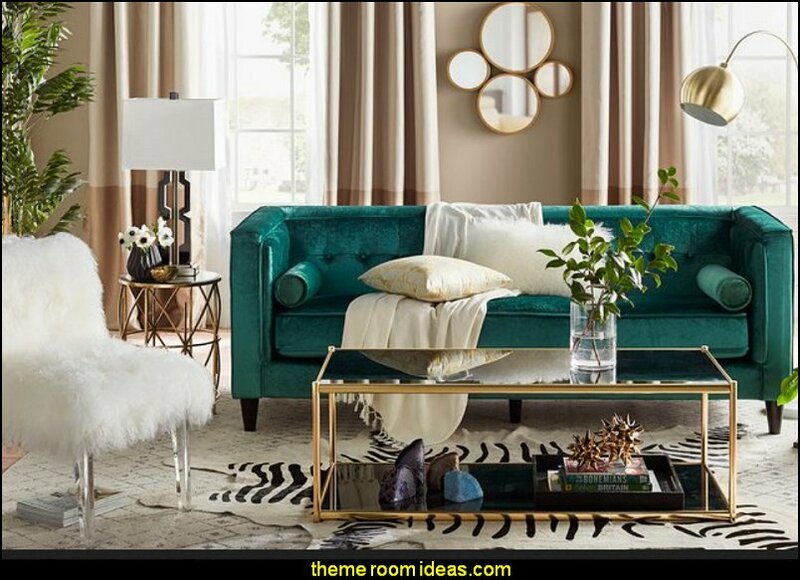 Add a pop of color and you're looking at a room that will have guests gasping in awe. Transform an empty wall with this Venetian-style large buffet wall mirror. 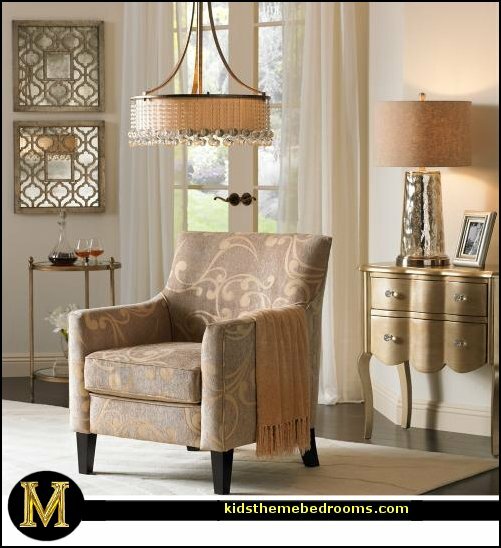 With an elegant gold finish pattern that accents the openwork scroll pattern in the outer border. A beveled inner glass adds a more complete look to finish the design. Enhanced with decorative detailing, this contemporary silver finish 4-door mirrored buffet cabinet is a perfect fit for a modern dining space. 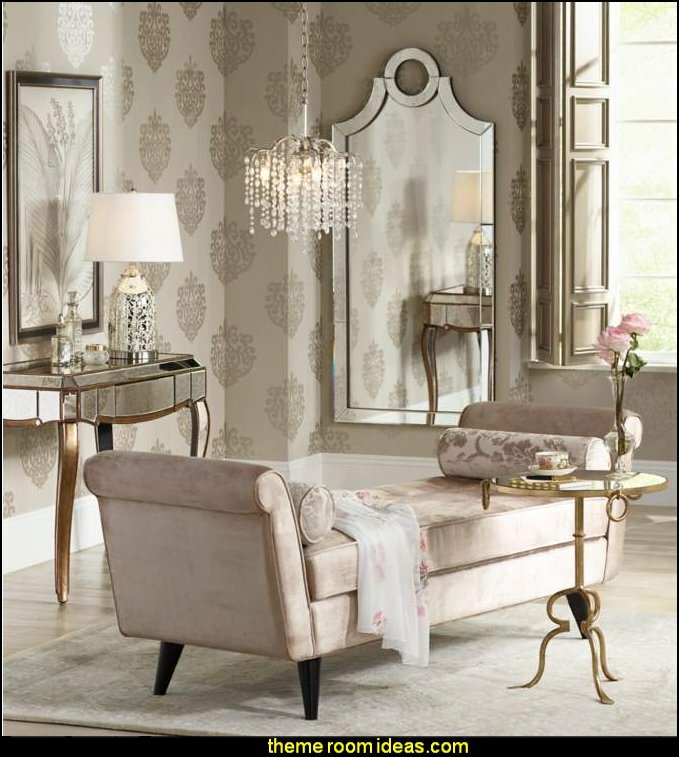 With classic glitz and endless glamor, the Hollywood Swank collection by Aico Michael Amini will bring the perfect marriage of drama and passion into your home setting. Breathing with old-Hollywood style. In addition, elegant details such as butterfly door handles, light bulb-lined mirrors, symmetric metal trimming and cabriole legs add a level of stunning sophistication to the overall look. 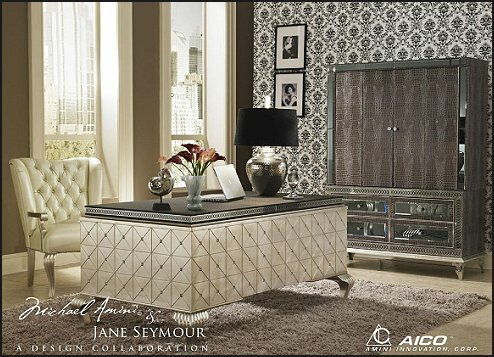 Liven any room in your home with dazzling designs by adding the Hollywood Swank collection by Aico Michael Armini to the decor. A little luxe goes a long way in this traditional living room. A comfy cream chenille love seat and tufted linen scroll back chair convey relaxed elegance in this Trad Chic living room. Charming nail head trim storage ottomans double as accent tables, and hits of glitz found in the exquisite champagne crystal chandelier, gold leaf accent table and classic mercury glass lighting add a glamorous glimmer to the room. A colorful amber glass bowl and mother of pearl accent table bring a splash of color and dash of panache to this posh space. Bring Hollywood sparkle to this contemporary living room! 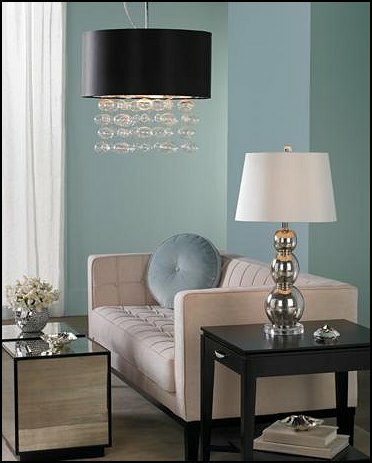 Paired with mirrored accents, a dramatic chandelier with cascading glass bubbles, and a reflective stacked globe table lamp add chic and sparkle to the room. 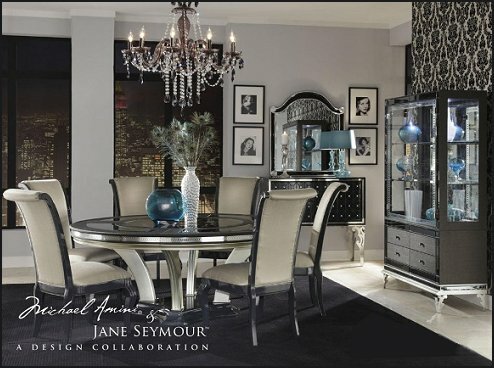 us brushed metals, sparkling crystal, lacquered ebony casegoods, and a plush white area rug. Modern, stylish ..... with a touch of Hollywood glam. 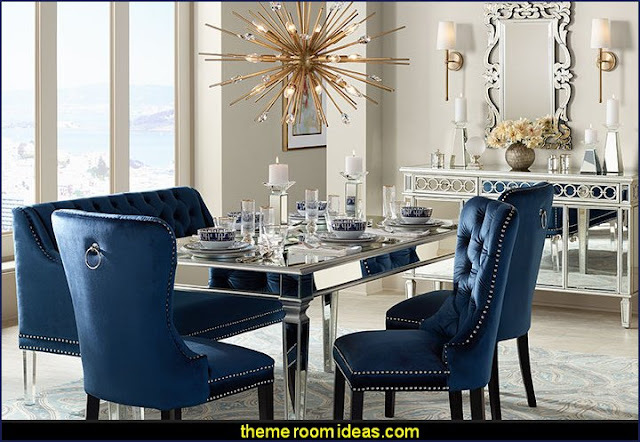 Using mirrored finishes is a must for the Hollywood design glam theme. 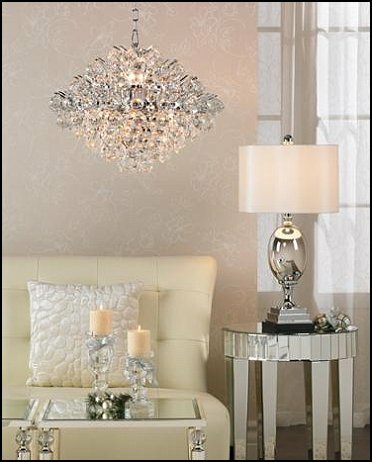 A stunning crystal chandelier sparkles alongsidea mirrored side table and a highly-polished chrome lamp in this living room photo. With ivory tone-on-tone wallpaper, an ivory leather sofa, and a chic opalescent ivory pillow, this neutral color palette of warm ivories and cool chrome looks high-end and incredibly sophisticated. 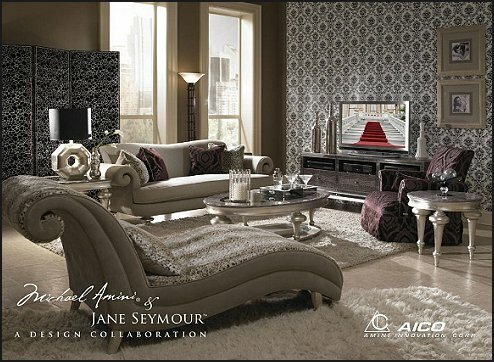 Crystal accents, plush red velvet upholstery, and Luxe inlaid detailing give this transitional living room picture a glamorous old Hollywood feel. 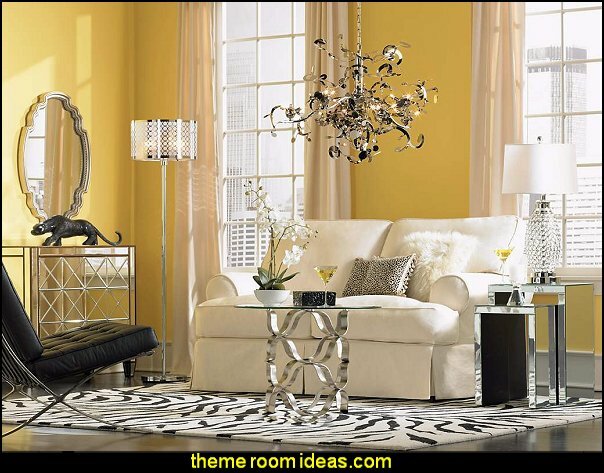 Glamor pallette of gold, ivory, white and soft gray. 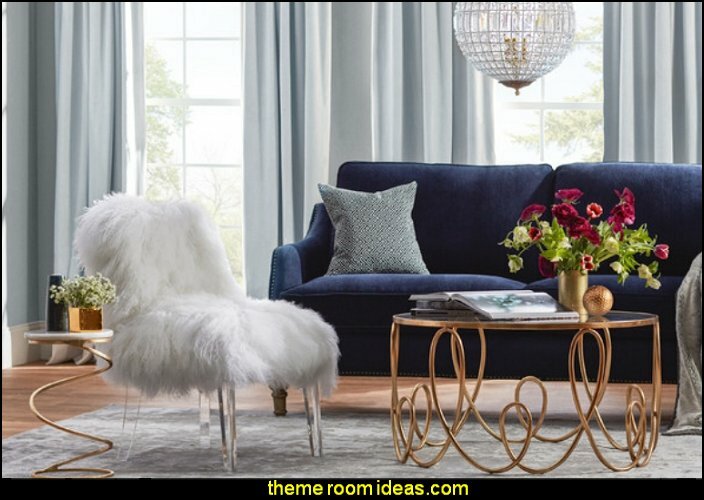 Glamorous entertaining space.... elegant diamond tufted tuxedo sofas .... crystal chandeliers add the sparkling touches ... accented with glossy finishes .... and a whisper of zebra ... bring this glam style together. 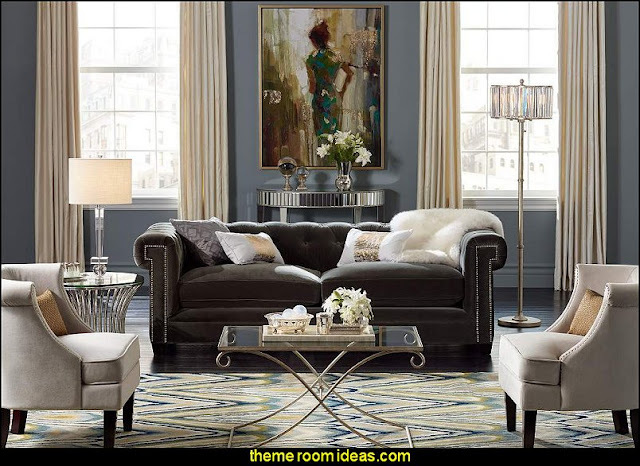 Tidy and tailored, sofa with button tufting is a classic piece to center your Hollywood theme design around. Dark stained base provides contrast to the light neutral upholstery, mixed with gorgeous antique pieces and mirrored accents completes the glam look. Understated elegance is key in Warm Luxe decor. Soft fabrics, soothing gold and beige tones, and glimmering accents define Warm Luxe. This design approach is subtle and graceful and never goes out of style. 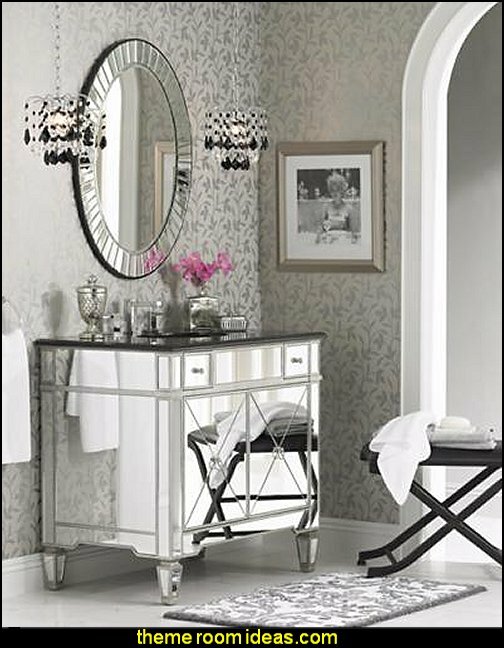 Add a beautiful mirror console table to a hallway, entryway, or anywhere else you need extra storage and a shining accent to reflect your style. Antique Gold Wall Mirror. Add interest to your living space with the cut corner design wall mirror. Get a Traditional Luxe living room design with warm gold finishes. Warm gold finishes lend a Traditional Luxe look to this living room design. 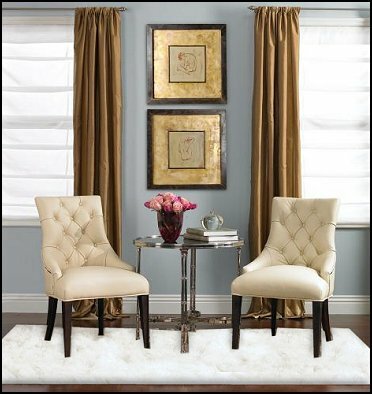 Combined with sparkling crystals and plush upholstery, the look is upscale chic and always classic. This pair of decorative framed wall mirrors will elegantly accent your decor, perfect for adding that pretty detail to a room. The wood frame features a Moroccan design in a clean silver finish. With only a small distressed mirror in the center, this framed pair is more for aesthetics than function. 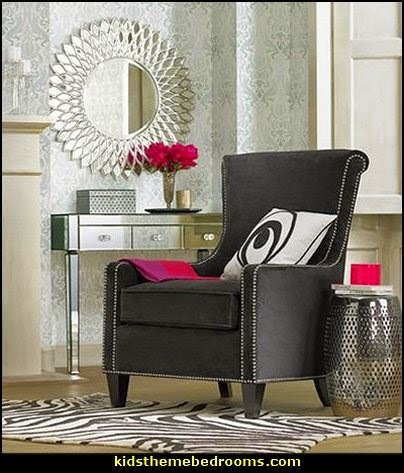 Add a luxurious accent to your decor with this lovely large wall mirror. The frameless style adds a modern touch, while the beveled edges in the bordered tiles adds depth. Featuring an antique glass finish with bronze mottling. This Trad Glam sitting area is a great escape. Trad Glam is relaxed elegance. This lovely bedroom sitting area, with its warm gold-tone lighting, comfy chic chaise and stunning vintage-style mirrored console that doubles as a vanity or writing table, provides a peaceful space to start or end your busy day. Geometric shapes and lavish accents are components of Art Deco style echoed in this Luxe Living Room. 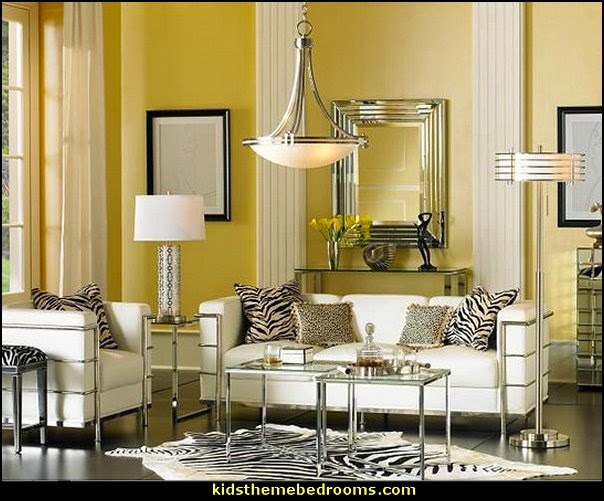 Decadent lemon chiffon wall color provides an intriguing contrast to exotic black and white zebra print. Plush Italian leather and brilliant polished steel tube chrome keep things from getting too severe by softening the strong geometric silhouettes of the seating. 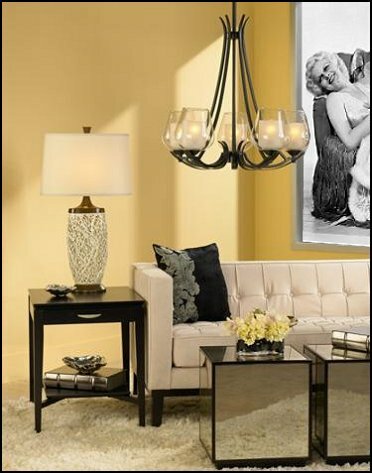 And the decidedly Deco mirror and alabaster glass pendant light add opulent sparkle to the mix. This demilune antique silver and mirror console table shines like a diamond in any room thanks to a stunning design reminiscent of channel-set baguettes. 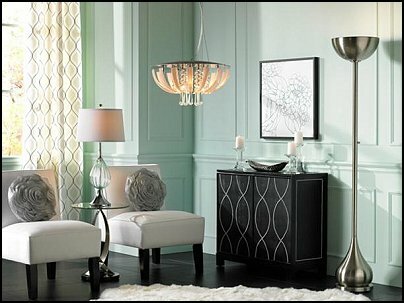 Traditional and contemporary elements combine to create this unique floor lamp.